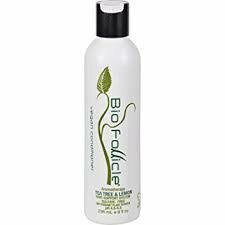 Bio Follicle Vegan Conditioner Tea Tree & Lemon is scented and enhanced with an exclusive blend of Tea Tree and Lemon therapeutic-grade essential oils in a rich plant based conditioner. Apply to clean hair, massage and leave on 3 to 5 minutes, then rinse. Aqua (Water), Vegetable Glycerin, Olive Oil, Grapeseed Oil, Sorbitan Laurate, Cetyl Alcohol, Behentrimonium Chloride, Cocamidopropyl Betaine, Panthenol, Hydrolyzed Rice Protein, Phenoxyethanol, Melaleuca Alternifolia (Tea Tree) Oil, Eucalyptus Globulus (Eucalyptus) Oil, Lavendula Burnati (Lavendin) Oil, Leptospemum Petersonii (Lemon Tea Tree) Oil, Kunzea Ambigua (Kunzea) Oil, Ethylhexylglycerin. (Preservative Complex from plant sources).